Hurricane Irene weakened into a tropical storm Sunday, but it still packed a powerful punch that ripped recreational boats from their moorings and destroyed docks in Southern New England. "There were about 35 boats that broke loose from their moorings in New Bedford (Mass. ), which is a hurricane-protected area," said Capt. Clint Allen, owner of New Bedford Marine Rescue (www.towboatusnb.com), a TowBoatUS franchise. "We recovered most of them during the storm." Four loose boats crashed into a marina (Capt. Leroy&apos;s) "and just devastated it," said Allen. "The docks are just completely destroyed. And at another marina the floating docks are completely ruined – just smashed to smithereens. So we had some significant damage for a so-called hurricane-protected harbor. The harbors east and west of us are open to the sea but sustained very little damage – only four boats in each harbor broke free." 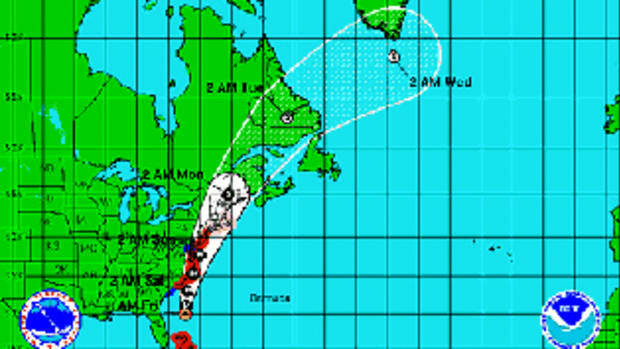 Irene caused major flooding and widespread power outages Sunday in New York and New England. It was estimated that 4 million customers were without power from North Carolina into the Northeast, according to the Weather Channel website. In Onset Bay, Mass. boat owner and waterfront resident Gail Maddigan watched Irene drag a 55-foot motoryacht across the bay and onto the beach. A 25-foot powerboat followed soon after and ended up in the same area of the beach. "The winds have not subsided since 11 a.m.," Maddigan wrote in an e-mail at 4 p.m. Sunday. "If anything, they&apos;re stronger." 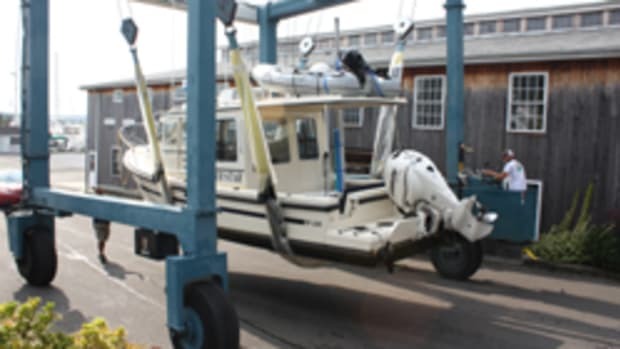 Click play to watch Irene knock boats around in New Bedford Harbor and click here for a report on the damage in Massachusetts. Allen, whose company runs four towboats (two 24-foot RIBs, two 28-foot powercats and a 25-foot Parker), estimated winds speeds in New Bedford Harbor at a steady 60 mph throughout the day on Sunday. "We retreived nine or 10 boats at the height of the storm, which was midday," he said. "We worked from 9:30 in the morning to 9:30 at night. There was no one on these boats but we did have to pick up some sailors in the morning from their 35-footer who thought they were going to stay on their [moored] boat and ride it out." 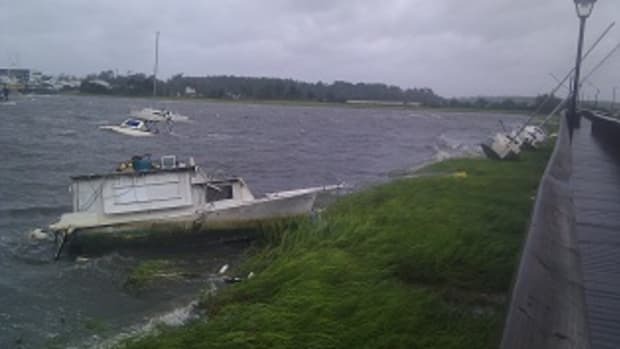 In Rhode Island, marina damage was minimal, reports Capt. John Andrews, owner of Safe/Sea (www.safesea.com), also a TowBoatUS contractor. "We had about five jobs saving boats in the storm," says Andrews, whose fleet of RIBs includes two 33- and two 35-footers and a 28-footer. (All are diesel-powered with waterjet drives.) "These were moored boats that broke loose or transients. We have several that are still on the beach or on the rocks. They were all boats we were going to save but they got into such bad situations so fast that we couldn&apos;t get them." In other areas of Rhode Island, only a few boats were taken from their moorings, he says. "I don&apos;t think there were any problems in Newport, I think it was pretty clean," he said. Andrews said his crew worked through the entire storm. "We started at 6 a.m. and finished up around 7 o&apos;clock last night," he says. "It was a workable storm for our equipment and people." Burr’s Marina in New London, Conn., near the mouth of the Thames River, reported three feet of surge above high tide on Sunday, enough to fill the parking lot. But there was little damage to the marina – some loose dock boards and a few boats with staved-in sides, says Adam Bergamo, a member of the Burr family. “We hauled 30-odd boats in two days,” Bergamo says. Just five boats chose to ride it out at the dock. A couple of boats broke their moorings, and one – a schooner – landed softly on a sand beach. “It missed two different rock piles,” office manager Barbara Simoncini says. Ned Ahlborn, manager of Brewer Yacht Yard Mystic in Mystic, Conn., was out in a center console surveying the Mystic River on Monday morning. “Everything looks pretty good,” he said. Boats at the Mystic yard lost some canvas. There was some dock damage at Mullins Marine Service on the river and at a local boat and tackle shop. Ahlborn says the surge on the river was the highest he has seen in 24 years, but the water only made it up to his parking lot. Damage at Brewer Ferry Point Marina in Old Saybrook, Conn., was minor, said Alicia Klemans, who was manning the phones. Reports from Brewer Capri Marina in Port Washington, N.Y., and Brewer Post Road Boat Yard in Mamaroneck Harbor, N.Y., were about the same. The yards were in good shape and ready to open, although the power was still out on Monday morning at the Old Saybrook and Port Washington yards. At Danford’s Hotel & Marina in Port Jefferson, N.Y., on the north shore of eastern Long Island, dockmaster David Reutershan says the surge was 3 ½ to 4 feet maximum, and there were sustained winds of about 45 mph, with gusts of 50 to 70 mph. All but two of his boats left the marina. He was pleased that all of his slipholders heeded warnings and cleared out, but he was shocked that a number of his customers had made no hurricane plan and came to him at the last minute, asking, “Where do I go?” Danford’s has no upland storage, so he told them to go where they have their boats hauled in the winter. On Montauk, damage was light, too. “We had tropical force winds – gusts 50 to 60 [mph], sustained winds around 50,” says Rich Schoen, dockmaster at Montauk Marine Basin. There were 60 boats at the dock. The tide came just six inches over the dock. “We’ve seen nor’easters that were worse,” he says. - Jim Flannery contributed to this report.